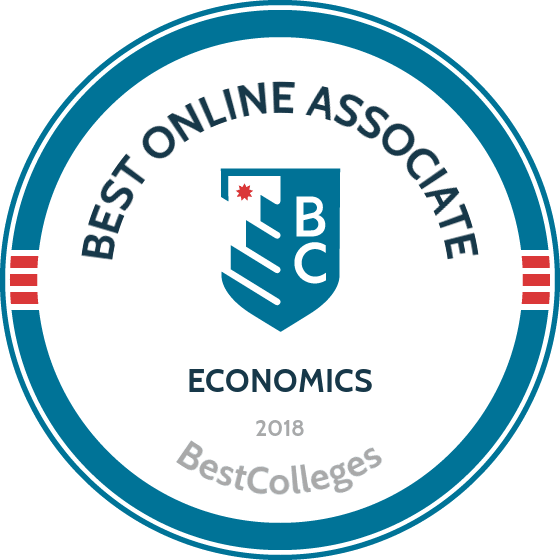 What are the Best Online Associate in Economics Programs? What Else can I Expect from an Online Associate in Economics Program? What Can I Do With an Associate in Economics Degree? Economists analyze the latest data on consumer trends, community demographics, and international trade to advise companies and governments on how to make the best financial decisions possible. Successful economists have skills in critical analysis, problem solving, and predicting future trends. Students with an online associate degree in economics are able to find careers in multiple fields, including policy analysis, government work, banking, and insurance. Furthermore, according to the Bureau of Labor Statistics, professionals with an associate degree earned more than those with a high school degree or some college work but no degree. Located in Los Altos Hills, California, Foothill College offers an online associate degree in economics for students looking to build an educational foundation in business and finance. Coursework for the associate in arts in economics covers microeconomics and macroeconomics, local and international political economies, calculus and statistics, and the psychology behind field research methods and design. To earn the online economics degree, students must complete 90 course credits, including 60 credits of general education, 18 core degree credits, and 12 supporting credits. Full-time students normally complete the degree in two years. Online courses, exclusively taught through Canvas, are taught on the quarter schedule. Foothill College welcomes transfer students into their program. The school also operates the Transfer Center for students interested in pursuing a bachelor’s degree. The associate degree in business, management and economics at SUNY Empire State College balances economics with business administration. This degree offers specializations in economic theory, practical application, and government policy. The program is specifically designed for those interested in pursuing a bachelor’s degree or graduate education. Students can transfer up to 40 of the required 64 credits from other accredited institutions. Students can sign up for as many courses as they feel capable of completing. Typically, students complete the program in two to two-and-a-half years. As a state school, participants of this program are qualified to apply for grants and scholarships available to students enrolled in New York state colleges. Located in Great Bend, Kansas, Barton Community College offers a business and technology career training program. This program prepares students to complete a bachelor’s degree in business, economics, or finance. Barton prioritizes small classroom sizes, accessible instructors, and practical skills. The degree requires 64 credit hours, of which at least 15 credits must be completed at Barton. Online courses are delivered through Canvas. All coursework is individually paced, giving students a flexible schedule to complete course material. Students who complete this economics degree online can pursue careers in accounting, communications, finance, marketing, banking, and tourism. To assist incoming students, Barton offers scholarships specifically for Kansas residents with a good GPA or high ACT scores. The school also offers a transferability track that allows students to easily transfer to a four year college. The online associate degree in economics at Palo Alto College in California prepares students to complete a bachelor’s degree in economics at another institution. The distance learning program requires 60 credits to complete, with a core curriculum focused on building practical skills in communication, algebra, and accounting. Palo Alto College’s Transfer Center tracks student progress to ensure that all coursework will be recognized by future institutions. Distance learning courses are taught on Canvas through video conferencing and telecourses. All courses coincide with the campus quarter term schedule. The program typically requires two to two and a half years to complete. Palo Alto College offers scholarships to assist with funding, but students must first apply for FAFSA. Tyler Junior College’s rigorous coursework is designed to prepare students for the working world. The AA in economics teaches students to make intelligent and efficient choices. Graduates are prepared for future career opportunities in business, finance, or government. This online economics degree requires 60 credit hours; 16 credits cover upper-level coursework in economics. Overall, the online associate degree in economics typically takes two years to complete. Coursework is designed to fast track students into any four year college. Tyler Junior College maintains a Transfer Center, where students can track their progress for entry into a bachelor’s program at another institution. The school has special agreements with UT Tyler, Stephen F. Austin State University, and Baylor University. The school also offers multiple financial aid options, including scholarships, loans, and grants, to help students reach their educational goals. An economics degree online teaches students the skills necessary to gather, analyze, and report on financial and societal trends. Economists combine mathematics and the study of human nature to predict the activity of consumers, corporations, and constituents. The following section describes the typical curriculum and program requirements necessary to achieve an online associate degree in economics. Though courses differ between programs, the core curriculum of an online economics degree is fairly standard. Classes cover data collection, how to anticipate trends, and the mathematic skills necessary for analysis. The following list details typical courses required for an online economics degree and their practical uses in the field. Principles of Macroeconomics: Students learn about large-scale economies in this course. Topics include government, corporate, and institutional policy decisions and their effects. Students will learn algebraic formulas used to calculate GDP, unemployment, and inflation. Principles of Microeconomics: This course covers the economic consequences of small-scale, individualized decision-making. This course focuses on skills in algebra, statistics, and probability. Students learn how to set prices and find market equilibrium. Global Economy: This class explains the history of international trade and the global economy. Students learn about the social and political issues underpinning shifts in the global economy and the effects of these international trends on local populations. Business Calculus: This course covers formulas in calculus relevant to business analytics, including limits and continuity, derivatives and antiderivatives, and graphing. These skills are necessary to understand and interpret economic data. Students learn valuable tools to communicate data to a company, collaborator, or employer. How Long Does it Take to Get an Online Associate in Economics? On average, students complete an online associate degree in economics in two years. Of course, progress is dependent on how many courses you take at one time. Those with a full time job or a family might choose to take fewer classes, extending the length of their degree. Some economics programs allow individually paced learning. An individually paced class has a start date, but a flexible end date, allowing you to take as much time as you need to complete coursework. By contrast, courses based on the cohort learning model begin and end on a set schedule, usually coinciding with the quarter or semester system of a traditional college campus. As you look at prospective online programs, be sure to check whether courses are individually paced or cohort based to ensure that the program best suits your lifestyle. Overall, online associate degrees in economics lead to bachelor's degrees in the same field or related fields such as business, accounting, and political science. There are several career paths available for those who complete an economics degree online, including economist, actuary, and mathematician. Economists have strong analytical skills, a drive for mathematical precision, and an ability to present research. Most positions in this field are full time. Economists often work collaboratively with specialists across multiple fields to produce data for research firms, think tanks, and corporations. The following list details some careers possible with an online degree in economics. Operations research analysts work with business managers to improve operations within an organization. These analysts weigh the potential benefits of an innovation against its costs. This position requires a bachelor's or master's degree. Actuaries assess financial risk. Actuaries create future projections that directly influence insurance policies, investments, pension plans, and business strategies. This career requires a bachelor's degree in economics, mathematics, or another related field. Political scientists study societal relationships, political issues, and governmental processes. These professionals use economic data to predict future political issues. Most opportunities in political science require a master's degree. Mathematicians use algorithms, mathematical theory, and statistical models to interpret, prove, or project results. Mathematicians can work in the public or private sector. Mathematicians often collaborate with professionals in other fields such as engineers, businesspeople, and chemists. This profession usually requires a master's or PhD. Economists research issues, present findings, and project future market directions. Economists work across multiple fields, including commerce, healthcare, education, and government. Often, practitioners focus on a particular area of interest such as behavioral, financial, industrial, labor, or community economics. This profession requires a master's degree. Since most jobs in economics require at least a bachelor's degree, those with an associate degree usually pursue further education. Many schools that offer economics degrees online describe their transfer options, often with specific agreements between schools. Earning a higher degree in economics or another related field opens up more job opportunities. Bachelor's in Economics: This program expands on the skills taught in the associate in economics. The degree teaches students qualitative and quantitative research methods. Topics include economic impacts in companies, communities, and the global market. Bachelor's in Political Science: Students study American politics, global affairs, and political theory with this degree. Graduates can find a career in local or national government, law, business, and international relations. The versatile skills honed in this program include clear communication, sharp analysis, and leadership. Bachelor's in Mathematics: Mathematicians apply theory and analytical methods to new problems across multiple fields. Graduates can work in the fields of computer programing, finance, technology, and engineering. Bachelor's in Statistics: Students gain fundamental mathematical and analytical skills with a degree in statistics. Statisticians solve real world problems through analysis of the latest statistical data. Graduates can work for the federal government, development organizations, and scientific corporations. Bachelor's in Informatics: Students learn how to find practical applications for the latest technologies in order to improve the quality of life of people across the world. Graduates create new uses for technology and analyze how humans interact with that technology. Once you have selected a program that best suits your needs, it is important to consider funding options for your online associate degree in economics. FAFSA, the Free Application for Federal Student Aid, is an excellent place to start: this application tells you which federal subsidized and unsubsidized loans, grants, and work study opportunities are available to you. Be sure to also check the financial options offered through your chosen institution. Some schools offer assistance in the form of merit or need based scholarships.